Python on Android. Wouldn't that make so many things so much easier? I've known for a long time about SL4A, but when I read, a year or two ago, that Google officially disclaimed support for languages other than Java and C and didn't want their employees working on projects like SL4A, I decided it wasn't a good bet. But recently I heard from someone who had just discovered SL4A and its Python support and talked about it like a going thing. I had an Android scripting problem I really wanted to solve, and decided it was time to take another look. It turns out SL4A and its Python interpreter are still being maintained, and indeed, I was able to solve my problem that way. But the documentation was scanty at best. So here are some shortcuts. Enable "Unknown Sources" under Application settings if you haven't already. Install sl4a from the apk. Do not install Python yet. Find SL4A in Applications and run it. It will say "no matches found" (i.e. no scripts) but that's okay: the important thing is that it creates the directory where the scripts will live, /sdcard/sl4a/scripts, without which PythonForAndroid would fail to install. Install PythonForAndroid from the apk. Find Python for Android in Applications and run it. Tap Install. This will install the sample scripts, and you'll be ready to go. You've written a script and it does what you want. But to run it, you have to run SL4A, choose the Python interpreter, scroll around to find the script, tap on it, and indicate whether or not you want to see the console. Way too many steps! Hit the add icon button ("+") on the main screen. This will give you the familiar twin-snake Python icon on your home screen. There doesn't seem to be any way to change this to a different icon. Well, that still seems to be a big hole in the whole SL4A model. You can write great scripts that print to the console. You can even do a few specialized things, like popup menus, messages (what the Python Android module calls makeToast()) and notifications. The test.py sample script is a great illustration of how to use all those features, plus a lot more. But what if you want to show a window, put a few buttons in it, let the user control things? Nobody seems to have thought about that possibility. I mean, it's not "sorry, we haven't had time to implement this", it isn't even mentioned as something someone would want to do on an Android device. Boggle. The only possibility I've found is that there is apparently a way to use Android's WebView class from Python. I have not tried this yet; when I do, I'll write it up separately. WebView may not be the best way to do UI. I've spent many hours tearing my hair out over its limitations even when called from Java. But still, it's something. And one very interesting thing about it is that it provides an easy way to call up an HTML page, either local or remote, from an Android home screen icon. So that may be the best reason yet to check out SL4A. I've used backquotes, and their cognate $(), plenty. For instance, you can do things like PS1=$(hostname): or PS1=`hostname`: to set your prompt to the current hostname: the shell runs the hostname command, takes its output, and substitutes that output in place of the backquoted or parenthesized expression. But I'd never seen that <(...) trick before, and immediately saw how useful it was. Backquotes or $() let you replace arguments to a command with a program's output -- they're great for generating short strings for programs that take all their arguments on the command line. But they're no good for programs that need to read a file, or several files. <(...) lets you take the output of a command and pass it to a program as though it was the contents of a file. And if you can do it more than once in the same command -- as in Little Girl's example -- that could be tremendously useful. It acts as though I had two files, which each have "hello" as their first line; but one has "there" as the second line, while the other has "world". And diff shows the difference. I don't think there's any way of doing anything like that with backquotes; you'd need to use temp files. Of course, I wanted to read more about it -- how have I gone all these years without knowing about this? -- and it looks like I'm not the only one who didn't know about it. In fact, none of the pages I found on shell pipeline tricks even mentioned it. It turns out it's called "process substitution" and I found it documented in Chapter 23 of the Advanced Bash-Scripting Guide. I tweeted it, and a friend who is a zsh master gave me some similar cool tricks. For instance, in zsh echo hi > >(cat) > >(cat -n) lets you pipe the output of a command to more than one other command. Shallow Thoughts has been nominated as a competitor in round two of the Foss Force Best Personal Linux or FOSS Blog Competition. There are plenty of excellent blogs on the list and I'm flattered to be included. If you have a moment, take a look and vote for your favorite (whether or not it's Shallow Thoughts). You can vote for up to two. If nothing else, it's a good excuse to check out some excellent articles on free software from a variety of writers. Voting ends on Monday. 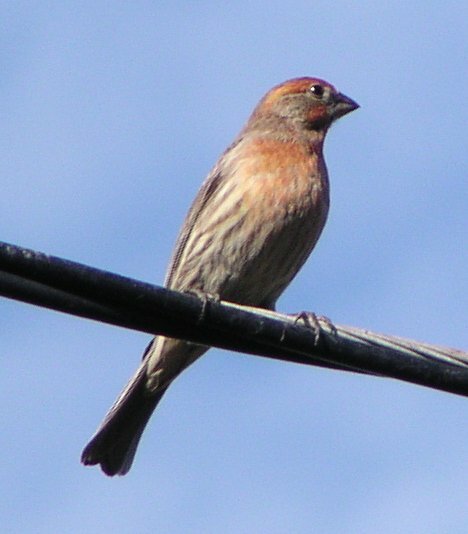 I was awakened at 6:30 this morning by what sounded like a young house finch learning to sing, just outside my window. It got me thinking. Every fall, songbirds which have stopped singing during high summer start up again, briefly, to sing for a few weeks before weather gets cold. A discussion several years ago on a local birding list concluded that nobody knows for sure why birds sing in autumn -- are they confused about the weather and think it's spring again, hoping for a last fling before the cold weather sets in, or what? There's a a wonderful ditty about it, "The Autumnal Recrudescence of the Amatory Urge", apparently written in the 1970s by Susan Stiles. It's too early in the year right now for autumnal anything -- it's still quite warm. But lying there in bed listening to the exploratory notes of a bird clearly not yet confident in his song, I got to thinking about how birds learn their songs. In most birds it's not innate: young male birds learn singing while still nestlings from listening to their father sing, much like human babies learn the rhythms of their native language from hearing their parents talk; and if you raise a songbird in a nest of another species, they will often learn the wrong song, or end up with some hybrid song that doesn't attract females of either species. (A good overview: The Development of Birdsong on Nature.) More recently, there have been all sorts of interesting studies on how young birds learn their local dialect, since a species' song varies quite a bit from one location to another. But ... not all birds sing much once the eggs are laid, do they? They sing their hearts out while acquiring a territory and trying to attract a female; but once nesting starts, I don't remember hearing much activity from the house finches. Mockingbirds are an exception: I've seen mockers singing day and night even after they're feeding nestlings, though not all male mockers are quite so industrious. But I thought most species stopped singing much once the nest was built and eggs laid. But if that's true, when do the young males learn their songs? Even if the father does sing a little, off and on, while the nestlings are being raised, that's not very much time to learn. Suppose the adults started singing again in the fall before the family disperses. Wouldn't that be an advantage to the young males who are just learning their songs? If a fledgling, off the nest and mostly able to care for himself, is "babbling", trying exploratory notes while learning what sounds he can make, wouldn't it be helpful to have a few nearby males who occasionally burst into song even if it's out of season? Maybe the "Autumnal Recrudescence" isn't birds being confused about the weather at all. Maybe it's an evolutionary aid to help the young birds crystallize their songs before heading into their first winter. By singing in autumn, the males help their sons crystallize their songs for the next year, which helps the sons be more successful when it's time to look for a mate next spring. Just a theory ... but I think it makes some sense, and I'll be listening to this autumn's chorus with new interest. Want to get started controlling hardware from your BeagleBone Black? I've found a lot of the documentation and tutorials a little sketchy, so here's what I hope is a quick start guide. First, where can you plug things in? The BBB has two huge header blocks, P8 and P9, but trying to find pinout diagrams for them is a problem. Don't blindly trust any diagram you find on the net; compare it against several others, and you may find there are big differences. I've found a lot of mislabeled BBB diagrams out there. The best I've found so far are the two tables at elinux.org/BeagleBone. No pictures, but the tables are fairly readable and seem to be correct. The official BeagleBone Black hardware manual is the reference you're actually supposed to use. It's a 121-page PDF full of incomprehensible and unexplained abbreviations. Good luck! The pin tables for P8 and P9 are on pp. 80 and 82. P8 and P8 are identified on p. 78. For basic GPIO output, you have a wide choice of pins. Use the tables to identify power and ground, then pick a GPIO pin that doesn't seem to have too many other uses. The Adafruit library can identify pins either by their location on the P8 and P9 headers, e.g. "P9_11", or by GPIO number, e.g. "GPIO0_26". Except -- with the latter designation, what's that extra zero between GPIO and _26? Is it always 0? Adafruit doesn't explain it. So for now I'm sticking to the PN_NN format. PWM is harder. Mostly because it's not easy to find out which pins can be used for GPIO. All the promotional literature on the BBB says it has 8 GPIO outputs -- but which ones are those? If you spend half an hour searching for "pwm" in that long PDF manual and collecting a list of pins with "pwm" in their description, you'll find 13 of them on P9 and 12 on P8. So that's no help. I haven't actually verified all of them yet, though. Once you've found a pin that works for PWM, the rest is easy. Start it and set an initial frequency with PWM.start(pin, freq), and then you can change the duty cycle with set_duty_cycle(pin, cycle) where cycle is a number between 0 and 100. The duty cycle is the reverse of what you might expect: if you have an LED plugged in, a duty cycle of 0 will be brightest, 100 will be dimmest. You can also change the frequency with PWM.set_frequency(pin, freq). I'm guessing freq is in Hertz, but they don't actually say. When you're done, you should call PWM.stop() and PWM.cleanup().